Not discovered until 1806, Sodalite really isn’t a gemstone at all. It’s typically a rich blue mineral stone named from the Greek for “salt stone” because of its sodium content. Sodalite also appears in gray, purple, orange, or yellow — often with white veining from traces of calcite. Relatively soft at 5.5 to 6 on the Mohs scale of hardness, Sodalite is found more often at craft shows than in commercial jewelry stores. It’s often cut into beads for necklaces, earrings, and bracelets, and it’s versatile enough to wear solo or with other stones (particularly white ones). Originally discovered in Greenland, Sodalite today has been found in Brazil, India, Russia, Namibia, and the U.S.
Sodalite is said to bring truth and honesty to communications, end arguments, and blend the logical with the spiritual. It’s believed to aid in self-worth and acceptance and help the wearer achieve emotional balance. Metaphysical healers associate Sodalite with the throat chakra (creativity and self-expression) and the third eye chakra (intuition and foresight). Often called the “poet’s stone,” Sodalite is outstanding for writers and other creatives, bridging the conscious and the sub-conscious, increasing inspiration, and helping one stand up for one’s beliefs. Athletes also can benefit from its boost to endurance and motivation. 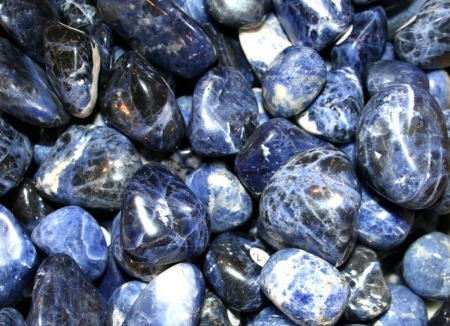 Feng Shui practitioners see Sodalite as a supplier of water energy, affecting one’s career path and life in general. They advise placing Sodalite in the northern area of a room or home to encourage forward momentum toward one’s goals. Healers say Sodalite helps with throat problems, boosts the immune system, reduces insomnia, and controls blood pressure. It’s also excellent for easing panic attacks and anxiety. Besides wearing or carrying Sodalite, you can meditate holding it or place it on your desk to reduce electromagnetic smog. Sodalite is a nontraditional birthstone for those born under the sign of Sagittarius (Nov. 22-Dec. 21). Avoid exposing Sodalite to harsh chemicals such as bleach. 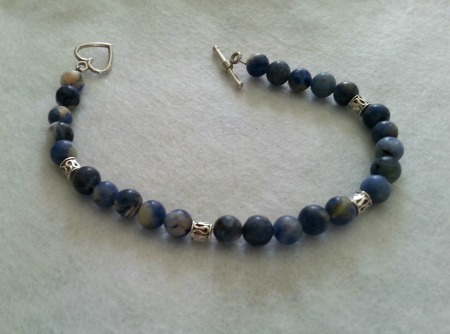 Remove Sodalite jewelry before exercising, playing sports, or doing household chores. Clean it in warm soapy water and store it separate from other jewelry pieces. This entry was posted in Sunday's Gem and tagged healing gemstones, properties of Sodalite, Sodalite. Bookmark the permalink. An intriguing stone and a beautiful bracelet, Debbie. I love its elegance and the heart shaped toggle or clasp. Thanks, Barb. I hadn’t thought I’d like a heart toggle — I feared a bracelet made with one would be forever slipping off my wrist. I was wrong. It’s sturdy, and the heart adds a nice bit of whimsy! It is beautiful. I love veined stones of any sort, but this is especially nice. The blue-black is a shade not often seen (remember when it still was in the big box of Crayolas?) but it certainly made a pretty bracelet. What is electromagnetic smog? Is this something I need to worry about? How would I know if I have it? HaHa! I wonder if our elected officials would appreciate a nice box of Sodalite … or two or three?!? It couldn’t hurt, you know, and we voters (regardless of party affiliation) can use all the help we can get. Whether a gemstone can “protect” against pollution from electronic devices … who knows?!? I will remember this for the next panic attack. (I’ll bet the margarita will be closer though ) Thanks, Debbie. Very interesting. John, I think the margarita might be just as effective … certainly in the short run! Debbie, another FASCINATING gemstone post, chock-full of such interesting information! Loved that because it’s so true. Blue is the color of the throat chakra, which has to do with communication and expression of our thoughts, beliefs, and truths. Whenever I feel a loss for words in communicating something I need to express, I visualize a blue pulsating light in my throat area to clear the way. I used to also do that when I was still acting before I had to go onstage and sing, and it really helped to relax my throat. The bracelet you made is absolutely beautiful! Brava! Thanks for sharing, my friend! Really enjoyed! Have a grrrreat week! Ron, I so love it when you add something interesting and helpful to my gemstone posts! You’re the expert here, my friend, not me, and it’s wonderful when your actual experience and expertise can attest to the information I’ve gathered. I’d never thought to visualize the color needed. Usually, I just put on a bracelet or necklace and hope for the best! A stone I’ve never come across before! I like it – it would go very well with denim. Love the bracelet too – you’re great at designing these! Why, thank you! And you’re absolutely right — it does go well with denim! Sodalite isn’t one you’d come across in a jewelry store. I think I found the stones for this bracelet at Hobby Lobby. Glad you like it! I hope you enjoy your Howlite, Lana — I find it very soothing! Thanks for letting me know a post I wrote had such a positive effect! Really?? I LOVE that — thank you!! I love to bead as well. I often get asked if I sell my stuff, and I thought about it but decided not to stretch myself that thin. increases inspiration huh? I should make a full length dress from those beads… and can I borrow your beautiful bracelet? Haha. I love heats and butterflies, so that latch caught my attention. Aw, thanks! I have another friend who likes butterflies, too. Such happy creatures, flitting from flower to flower in their colorful gowns!